Justin Blackmon isn't making a great first impression with collectors. Scheduled to appear at the TriStar show in Houston over the weekend, he was a last-second cancellation for both Saturday and Sunday. Early Sunday, the Jaguars' first pick in the 2012 draft was charged with aggravated DUI in Oklahoma. When Blackmon cancelled on Saturday, TriStar officials were told that the receiver was sick. Collectors were refunded and TriStar issued an apology. Blackmon was pulled over around 3 AM Sunday morning where he blew a .24 blood alcohol level in a breathalyzer test, roughly three times the legal limit. The aggravated DUI charge stems from Blackmon registering a blood alcohol level higher than .15. He was originally pulled over for speeding. This is Blackmon's second DUI charge. He was arrested in Dallas back in 2010. After posting a $1,000 bond Sunday afternoon, the receiver was released from jail. 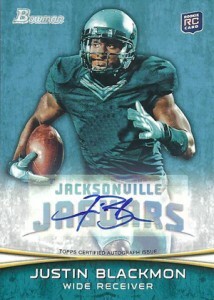 The first officially licensed Justin Blackmon cards were released last week in 2012 Bowman Football. He has several rookies in the product. The top sellers thus far on eBay have been a pair of Red Ink parallels of his rookie card that sold for $265 and $220. His regular 2012 Bowman Football autographed parallels have been trading for around $50. Nike NFL On Field Jacksonville Jaguars Justin Blackmon #14 Jersey Size XL.